The Art Center at Center of Academic Resources, Chulaongkorn University works to promote Thailand's contemporary art and culture. From website: Not dissimilar to other laboratories around Chulalongkorn campus, the Art Center has also been another venue for specialists to experiment, innovate and challenge previous perceptions in order to re-define new ideas. In conjunction with exhibiting well established traditional fine art media such as painting, printmaking, sculpture and photography. 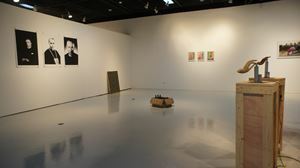 The Art Center also intends to be a platform where visual art can also extend beyond its tradition, onto areas of multi-disciplinary practices. For example, science specialists may be invited to collaborate with visual artists on a technology based project or perhaps historians may work well together with contemporary artists to explore new intellectual boundaries based on the combination of specialist know-how. Creativity is an essential craft of survival for all graduates in tomorrow’s world and imagination must extend beyond what we already understand.